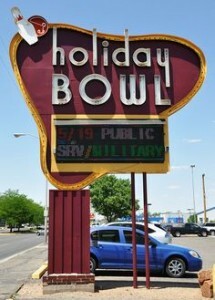 Our league bowls on Sunday evenings at 6pm at Holiday Bowl on Lomas and Pennsylvania. We bowl 18 week sessions​. We are a social league and love having new people join, either as a substitute or on a regular team. We have both options available to you, depending on your preference. Your skill level in bowling is not important, only your willingness to have a good time and meet new people! New season begins​ January 7, 2018 with a LEAGUE MEETING (all bowlers) at 4:30pm in the bar area of Holiday Bowl. Practice begins at 5:50pm and League play starts at 6pm. If you would like to be placed on a team, ​we can usually accommodate that request or if you would prefer to substitute on Sundays that you are available, ​we can fulfill that request as well, most of the time. If you are a substitute, you are not responsible for the weekly league fee of $17, however, you will still need to be sanctioned by USBC. If you are a sub, and would like to bowl on a certain Sunday, there is usually a team that needs a sub due to an absent bowler. Unfortunately, ​we​ don’t always know ahead of time, so you have to show up that Sunday and if ​we​ have a team that needs a sub, ​we ​can place you on their team. We also do monthly fun bowls, which are just social, non-league get-togethers, where anyone can come and we do it at various bowling houses across ABQ. Cost is $15 per person and includes three games, shoe rental and house ball use, if needed. To contact any of our officers, please use our Contact Form. Thank you. New Season Starts Sunday, August 13, 2017! Sign Up Today!